The Museum of Contemporary Art Detroit is located on the SE corner of Woodward and Garfield just 4 blocks south of the DIA. To access the MOCAD Store you must come in through the museum entrance. There is no charge for admission during regular business hours. The mission of the Museum of Contemporary Art Detroit is to present art at the forefront of contemporary culture. As a non-collecting institution, MOCAD is responsive to the cultural content of our time, fueling crucial dialogue, collaboration and public engagement. 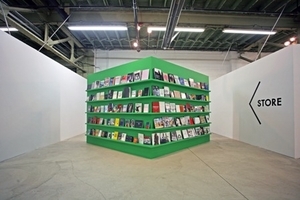 The MOCAD Store includes merchandise not sold in the metropolitan area, including specialized art and culture magazines, journals and books, as well as limited edition artists t-shirts and other functional objects.